The earthy sage notes make for a yummy, comforting fall breakfast in anticipation of Thanksgiving! Preheat the oven to 400 degrees. Coat a large saute pan with olive oil, add the garlic clove and the crushed red pepper and bring to medium heat. When the garlic has become golden brown and aromatic, remove it and discard. Add the sausage and brown. Add the mushrooms and season with the kosher salt. When the mushrooms have softened, add in the sage and white wine. Cook until the wine has almost been absorbed. Turn off the heat and reserve. Brush 4 ramekins with olive oil or cooking spray. Divide the sausage mixture equally among the ramekins and top each with an egg. Sprinkle each egg with a couple drops of olive oil and arrange on a baking sheet. Bake for 6-7 minutes. Remove and sprinkle each egg lightly with Gruyere cheese, put back in the oven and bake until the cheese is bubbly, the egg whites are cooked and the yolks are still runny, about 4 minutes. 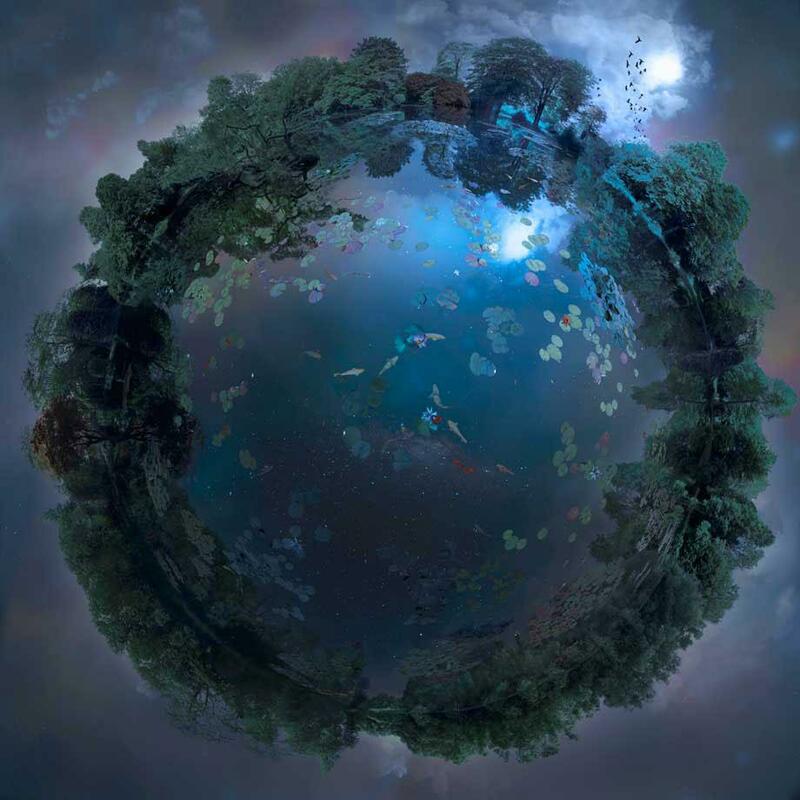 Sydney-based artist Catherine Nelson pieces together hundreds of photographs to make miniature worlds like the one above, which is my favorite of the collection, because for me it brings to life the setting of Shakespeare’s A Midsummer Night’s Dream. Nelson draws on her work in film special effects (she worked on the Harry Potter films) to make her art. Happy Halloween! What’s the origin of Jack-O’-Lanterns, anyway? Also, the White House is supposedly haunted by the ghosts of Abigail Adams, a swearing Andrew Jackson, Dolly Madison and Abraham Lincoln. All you need to know about upcoming Shakespeare movies. Also coming soon, an on-screen adaptation of Orwell’s Animal Farm. Hurricane Sandy could push rats out of their underground lairs, which means diseases, which means I have a house full of happy GIANTMicrobes. David Frum pens a thoughtful article on the real questions we should be asking on the abortion issue. The Sistine Chapel is attracting too many tourists (20,000 a day! ), making it difficult for people to actually enjoy the priceless works of art and creating humidity that could ruin the precious frescoes. The Vatican is considering limiting visitors. Sad, but understandable. 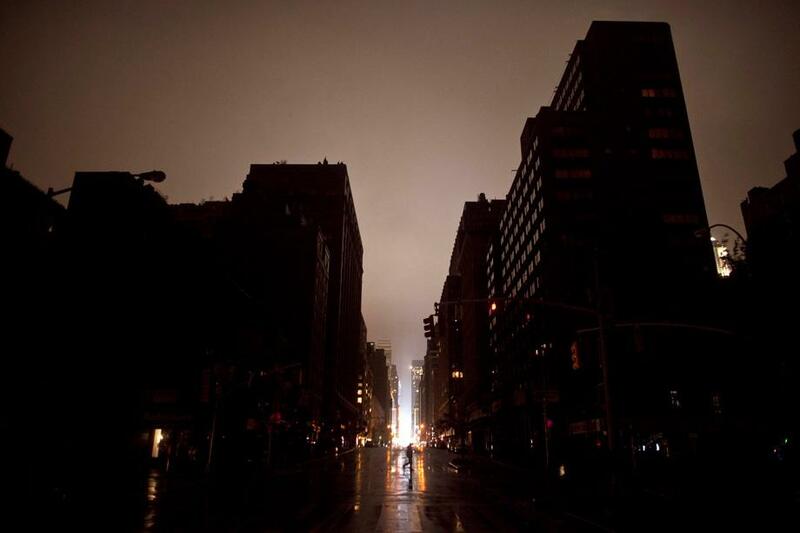 Manhattan goes dark last night under Sandy’s wrath. 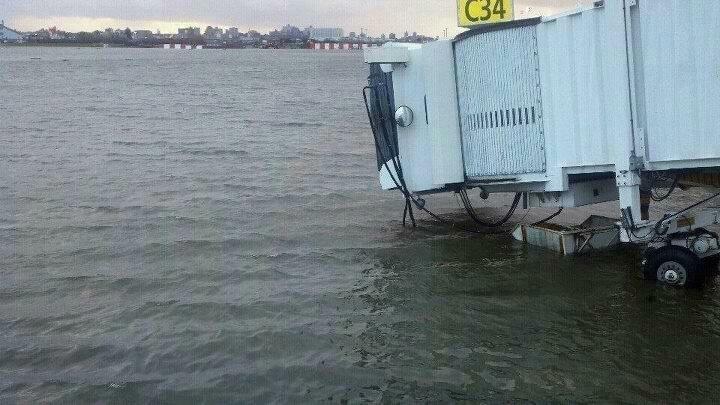 Below, LaGuardia Airport looks like it could remain closed for awhile. Photo via JetBlue. Stay safe and warm everyone. If anyone can tough this out, it’s New Yorkers! …dozens of smooth, contractor-built dwellings, a helicopter landing pad, a tennis court and a soccer field. A sports stadium and some underground bunkers are in the works, according to news reports. Glassy, newly paved roads lead to it, and the taupe walls of its neatly thatched rondavels are spotless despite the bucolic setting. This compound belongs to the most powerful man in the country, President Jacob Zuma, and is now the subject of multiple probes over how $27 million of government money came to be spent on upgrades to his private home, ostensibly for security. Tens of millions more dollars have been spent on roads around the compound and the village. Pretty nice house for a man who only makes $272,000, as much of the rest of the country lives in squalor. Eric Trager ponders the missing Obama-Romney debate on Egypt, which is becoming increasingly scary. …the latest draft of Egypt’s constitution conditions women’s equality on its adherence to “Islamic sharia judgments,” and Islamists have said that this could legalize marriage to young girls — perhaps as early as nine years-old. Would either Obama or Romney use American aid to Egypt as leverage to protect Egyptian girls from this horrific future?…Meanwhile, Egypt’s judicial system continues to prosecute blasphemy, and a television host critical of Egyptian President Mohamed Morsi was recently sentenced to four months in prison. Indeed, Morsi is establishing himself as Egypt’s next autocrat: he seized legislative and constitution authority through an August fiat, and he is reportedly considering a new emergency law that would rival Mubarak’s…Meanwhile, following the September 11 attack on the U.S. Embassy in Cairo, President Morsi waited two full days before speaking out, and he was recently caught on camerasaying “amen” as an imam prayed for the destruction of Jews. Two weeks ago, the supreme guide of the Muslim Brotherhood — which is effectively Egypt’s new ruling party — called for jihad to capture Jerusalem. And Salafist parties, which represent the strongest political challenge to the Muslim Brotherhood, have encouraged Egyptian youths to fight the “jihad” in Syria. When you consider Tokyo’s standing as one of the clubbing capitals of the world, it can come as a surprise to discover that its fabled nightspots are operating illegally. Dancing isn’t exactly forbidden here, but it’s only allowed in certain places, and regulated in such a way that all-night parties can’t technically happen. No ifs, no buts: can’t. Under the Law on Control and Improvement of Amusement Business (known as fueiho in Japanese, a contraction of fueiho eigyo-to no kisei oyobi gyomu no tekiseika-to ni kansuru horitsu), any establishment that permits dancing must obtain a license. This in turn imposes a number of requirements, the most significant of which are size – the main room must have at least 66m2 of unobstructed floor space – and opening hours: depending where it’s located, a club must close by either midnight or 1am…Ask anyone from Osaka, and they can tell you what’s happened to the club scene there: it’s dead. Since 2010, the police have been taking the fueiho law at face value, busting all-night parties and shutting down clubs that are permitting dancing without a proper license. Foreign jihadists have flooded into Mali to help Islamists hold the territory against what will hopefully be an ECOWAS/UN force to drive them out. Meanwhile, Salafists in Morocco have destroyed ancient stone carvings dating back more than 8,000 years. In other news about jerks destroying things, stone thieves have desecrated the ancient “Bronte Chapel” in West Yorkshire, where the Bronte sisters were baptized. Crowbar-wielding looters ripped up two 200-year-old burial slabs from the graveyard, wrenched stones from the chapel walls…It is feared that they will have thrown away the irreplaceable marked gravestones when they realised they were among their haul of valuable York stone…They had also taken slabs from the Bronte Way, a footpath linking points of interest across the moorland that inspired Wuthering Heights. An idiot Labour politician threatens to quit if a Christopher Hitchens bust goes up in Red Lion Square. QUIT THEN. 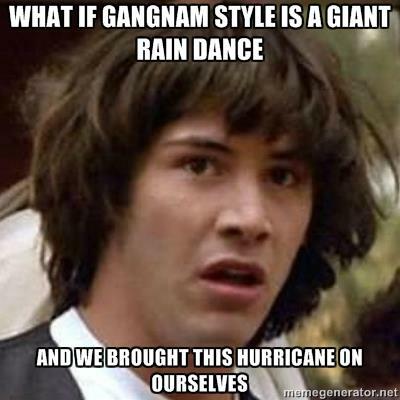 Here comes Hurricane Sandy! Everyone stay safe. 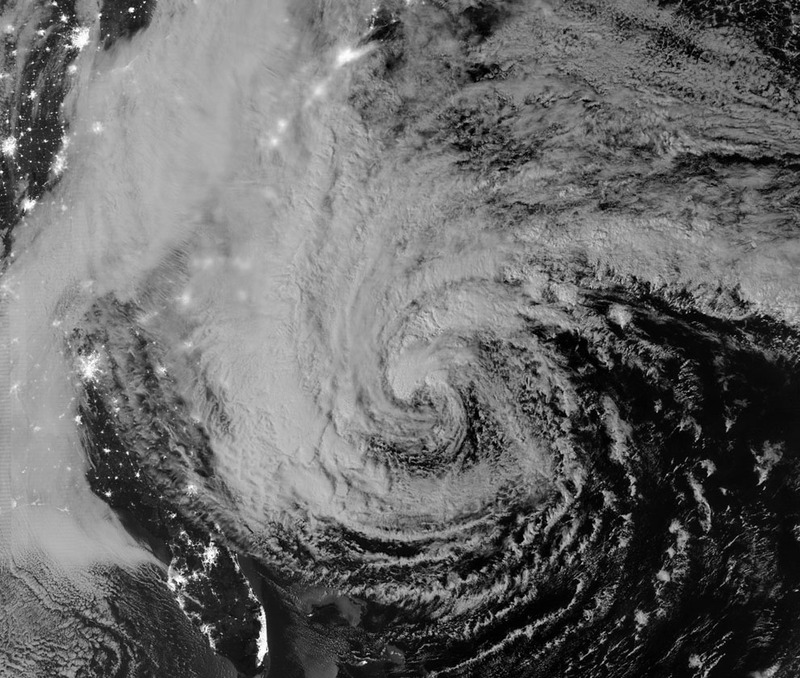 The above photo is via NASA, a nighttime satellite image acquired by the Visible Infrared Imaging Radiometer Suite (VIIRS) on the Suomi NPP satellite. I was very concerned about friends in New York this morning and then I saw joggers running by, laughing at the CNN reporter as she clutched her hat. Hell yes, New Yorkers, hell yes. Indestructible. Now it’s time to watch the news channels play, “Our reporters look more willing to be swept away than your reporters.” So far, Fox is losing. Get back out on the beach, pussies.